Browse: Home / MalwLess Simulator Tool (MST). 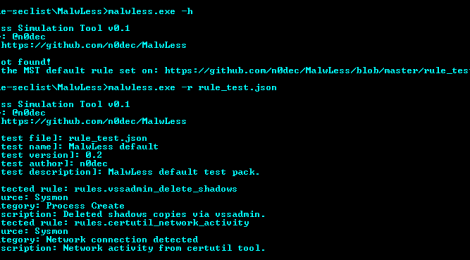 MalwLess is a open source tool developed in C# for blue teams that allows you to test your SIEM and security systems. Basically you can simulate the behaviour of a malicious attack or system compromise without the need to run processes or exploits in the network. It provides a framework based on rules that anyone can write, so when a new technique or attack comes out you can write your own rules and share it a with the community. These rules are parsed and written directly to the Windows EventLog. ← Hadoop File System Forensics Toolkit (HDFS FTK).